The mixing parts of the conical duo-spiral mixer are two asymmetric jib spirals. Whenever rotating around their axial lines, they are also revolving around the central axis of the conical container, with the help of rotating arms. 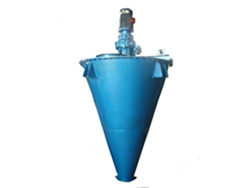 This equipment, t hrough rotation and revolution, heaves material repeatedly to create complex movements of shearing, convection and diffusion inside the conical container, so as to achieve the goal of mixing. This equipment is of wide scope of application, good applicability, easy to install and operate, long service life, convenient maintenance, short mixing time, high mixing evenness, no dead- end in either mixing or discharging. It will not heat up the heat-sensitive material, and will not crush or grind particles being mixed, which makes it ideal mixing equipment for materials of different finenesses and specific weights. This machine is widely used for mixing all kinds of power and particles such as pesticides, dyes, pigments, medicines, chemicals, fine chemicals, fertilizers, compound fertilizers, spices, plastics, metals, foods, food additives, feeds, feed additives, cements, cement additives, ceramics and ceramic glaze stains.